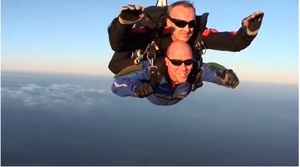 This is about Irish Parachute Club Instructor Ed De Khors, who tells of his love for skydiving. And how its allure has even driven some to quit their jobs, opting out of marriage/house/kids, to spend their lives jumping out of planes. Posted in Misc and tagged parachute at 9:22 am on November 23, 2012 by Broadsheet.